Excellent two day trip to the Makarora Region. Day 1: From Davis Flat to the head of Stewarts Creeks and over into the true right branch of Camerons Creek, where we camped at the second flats past the impressive gorge. Day 2: To the confluence with the North Branch and up the spur to Pt. 1809 m, from where we dropped back into Stewarts Creek to retrace or steps back down to the road. Team: Claire McElwain, Danilo Hegg, Heidi Baillie, Kat Manno, Viv Eyres and Nina Dickerhof. 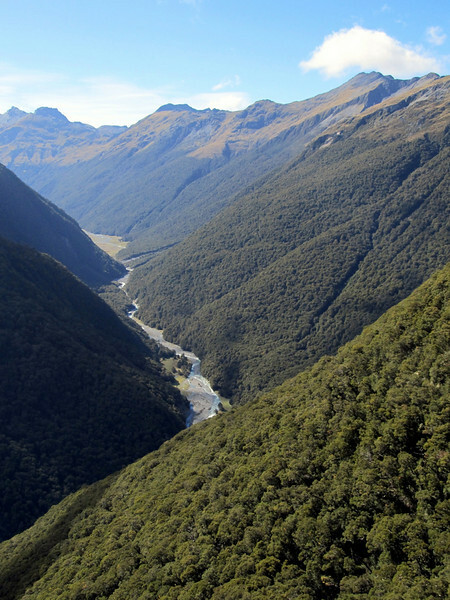 Looking up the Makarora Valley above bushline.